You control nothing – and yet you are the Master! You are a Master the moment you realize that you can never be one! Or, more simply, you can be in control of your Life when you realize that you don’t and can control nothing! This understanding is all that there is to spirituality! Most people don’t see spirituality as the flowering of internal awareness. They don’t get it that its essence lies in understanding an irrefutable paradox about Life __ that the less you believe you control, the more you are in control! People often see any spiritual perspective as ‘beyond’ them because they are so caught up in the quagmire of worry, anger, guilt, sorrow, suffering and the ‘earning-a-living’ syndrome. They have an ostrich-like mentality _ their heads are buried deep in their ill-formed beliefs. Their minds are closed although there’s so much grace, so much abundance, freely available. Kabir, the 15th century weaver-poet asked us to think: ‘What if a fish said it was thirsty?’ Wouldn’t that be the most stupidest of situations? Won’t you tell the fish to go re-examine its brain? How can a fish be thirsty when it is always in water? Quite similarly, the human mind is being foolish by seeking peace outside and by not looking within. By not allowing this flowering of awareness to happen from within. So, you conclude that you can’t be at peace, you refuse to look within and choose instead to be enslaved by your self-imposed limitations. Only when the awareness within you blooms, only when you understand that you can be in control while controlling nothing, only then will you see the Master in yourself. This understanding is elusive because, while being profound, it is, at the same time, too simplistic. That’s why, it doesn’t come to everyone __ especially when they are employing their education, their logic, in trying to make sense of Life. The truth is Life doesn’t conform to any framework or rules. Least of all your logic. So, Life is simple__and uncomplicated__when you simply accept its paradoxical, often inscrutable, nature. Look around you. Everything is illogical. Everything is contradictory to what you have been taught, what you have been brought up with or grown up on. Consider this – People behave thanklessly. There’s no dignity for human Life. Ethics and integrity don’t always make you successful anymore. You are encouraged to be worldly-wise than be honest and sincere. You find that trust is impossible to place and impractical to earn. Yet all these symptoms of a decadent world are true of people, even if they are from within your close circle of influence, whom you have no control over. You just can’t control what others do. Yet doesn’t all your grief come from wanting them to be different? Consider another context – A close friend of mine worked very hard. He was sincere and a genius with his craft __ marketing. He grew up the corporate ladder fast. Because there was none like him in the business. For a man with average qualifications, he earned substantially. He had only one son. And he was saving up for his son to be studying in an American University. Then one day, a few years ago, his 16-year-old son was killed in a car crash by a drunk driver. His son was not drunk. The driver was. I still remember what my friend told me when I visited him to condole his son’s passing away: “I wish I had known this would happen. I would have then spent enough time with my son rather than spending that time earning money for him!” It is so bizarre. A hard-working father saves up for his only son__only to lose him so tragically? How can you, despite all their education and logic, ever prevent what happens in Life? But you can surely choose how you respond to people and to Life. You can be grateful, you can be human, you can continue to be ethical, hard-working and honest. You may not earn as much as the others do, but you can sleep well. And doing all the things that you are comfortable doing, you can feel good and peaceful __ within you! This is your personal paradox and you must learn to accept it, appreciate it and live with it! You must, for the sake of your own inner peace, know that you cannot control anyone or anything outside of you in Life. If you can control anything at all, it is just how you live, how you relate to and how you respond to what Life throws at you! I may have shared this before. There’s this story of the Buddha. The Buddha was passing through a village. The people of that village were against him, against his philosophy, so they gathered around him to insult him. They used ugly words, vulgar words. The Buddha listened. Ananda, the Buddha’s disciple, who was with him, got very angry, but he couldn’t say anything because the Buddha was listening so silently, so patiently, as if he was enjoying the whole thing. Then even the crowd became a little frustrated because he was not getting irritated and it seemed as if he was enjoying. So beautiful, isn’t it? Another’s thoughts and actions are not in your control. What happens to you in Life is not in your control. This is the state we must all ascend to. When you awaken to this reality, you will discover that you are in control ONLY of yourself! 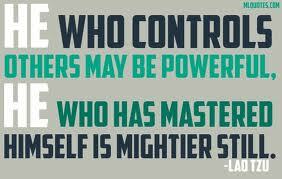 That you control nothing and yet you are the Master! From that clarity, bliss is born! Then everything that matters fills your Life__love, peace, good health and joy! Author AVIS ViswanathanPosted on March 14, 2013 March 14, 2016 Categories Ananda, Anger, Buddha, Control, Earning a Living, Fear, Guilt, http://schemas.google.com/blogger/2008/kind#post, Ilogical, Inner Peace, Intelligent Living, Logic, Master, WorryLeave a comment on You control nothing – and yet you are the Master!